For decades, wealthy countries and private companies have been using international aid, export credit support, and other foreign assistance – grants, loans, equity, and loan guarantees – to subsidize the expansion of the global fossil fuel industry. For more than a decade, Oil Change International has been tracking these public financial flows to fossil fuels. Our Shift the Subsidies Database of energy finance from international, regional, and bilateral public financial institutions around the world now includes over 7,000 energy finance transactions going back to 2008.
International financial institutions such as the World Bank Group and regional development banks, along with export credit agencies and bilateral aid agencies, provide tens of billions of dollars each year in direct financial support to oil, gas, and coal companies to expand production globally. This dirty energy infrastructure causes local pollution, relocation of communities, and contributes to climate change – which is already hitting developing countries and the poor hardest. Even worse, it rarely supports increased access to energy for the poor, despite this being a common excuse used by politicians when asked about their funding of dirty energy. As the threat of climate change increases and recognition of the benefits of basic energy services for the world’s poorest grows, some aid money and even some money from export credit agencies has begun to shift toward cleaner modes of energy production. Increasing access to energy for the world’s poorest people is also a slowly growing priority. But a great deal of public money continues to flow to large-scale fossil fuel development, including oil, gas, and coal exploration projects that seek to add new reserves to the world’s fossil fuel resources – despite the fact that climate science now tells us that we can only burn a small portion (less than 15 percent at maximum) of already-proven fossil fuel reserves if we are to prevent devastating climate change. This database is designed to provide information on the quantity, sources, and types of energy finance, that can then be used to encourage development banks and other public finance institutions to “Shift the Subsidies” from dirty energy to clean. Major Multilateral Development Banks, with data from 2008 to 2015. Bilateral Financing Agencies of the United States, with data from 2008 to 2015. Bilateral Financing Agencies of other G20 countries, with data from 2013 to 2015. Each project in the Shift the Subsidies database is classified by energy source (each of which is labeled “Fossil Fuel,” “Clean,” or “Other”), and evaluated individually for whether it specifically targets energy access for the poor. Additional information on the data collected and the classifications of information in the database is available on our Shift the Subsidies Methodology page. The Shift the Subsidies database tracks energy financing from 2008 to 2015 at the major Multilateral Development Banks (MDBs), including the World Bank Group (an institution which includes the International Bank for Reconstruction and Development (IBRD), International Development Association (IDA), International Finance Corporation (IFC), and Multilateral Investment Guarantee Agency (MIGA)) and regional development banks such as the African Development Bank (AfDB), Asian Development Bank (ADB), European Bank for Reconstruction and Development (EBRD), European Investment Bank (EIB), and Inter-American Development Bank (IDB). The MDBs listed here provided over $7 billion in public financing for fossil fuels in 2015, and over $83 billion in public financing for fossil fuels from 2008 to 2015. 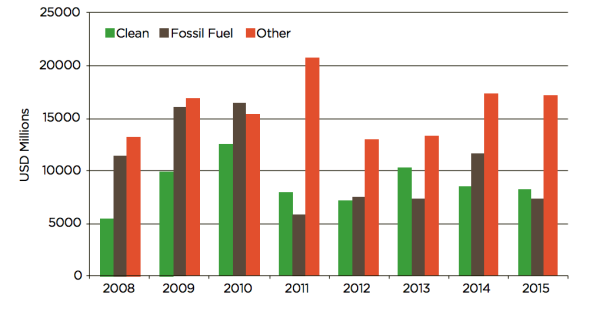 During that span, 30% of MDB energy financing went to fossil fuels, while just 25% went to clean energy. In 2015, despite increasing awareness and stated concern over climate change, 22% of multilateral development bank energy financing still went to fossil fuels. Concerningly, there is no clear trajectory in MDB finance for fossil fuels between 2011 and 2015, despite the growing threat of climate change and rapidly worsening climate impacts around the globe. 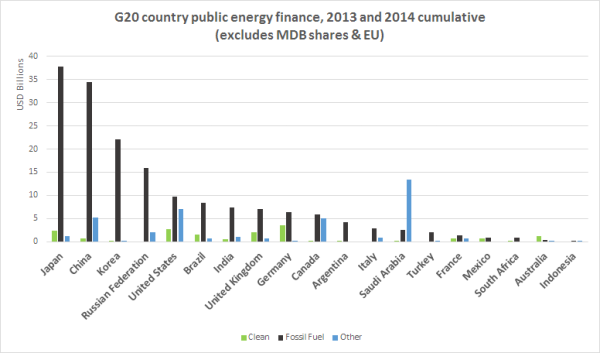 The Shift the Subsidies database also includes energy finance information on bilateral finance from G20 countries from 2013 to 2015. G20 countries include: Argentina, Australia, Brazil, Canada, China, France, Germany, India, Indonesia, Italy, Japan, South Korea, Mexico, Russia, Saudi Arabia, South Africa, Turkey, United Kingdom, and United States (data from 2008 to 2015), as well as the European Union. G20 governments continue to finance fossil fuels, and particularly oil and gas, at rates that far exceed financing for other energy sources, including renewable energy.